In 2012, the ITER Organization signed a EUR 74.5 million contract for the welding of the ITER vacuum vessel with the Spanish company Equipos Nucleares SA (ENSA). In addition to on-site welding and testing operations, the contract scope includes the development of specialized welding and testing tools and the qualification of processes and operators. 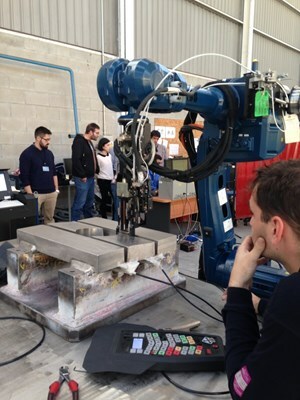 In October 2015, an interim design review was the occasion to visit the ENSA facilities, where testing is underway on prototype welding tools. Welding the ITER vacuum vessel and ports will require four years, 200 technicians, and a host of customized techniques and tools. Welding operations for the vacuum vessel will be one of the longest and most complex sequences of ITER machine assembly, requiring around 200 personnel and at least four years to complete. The nine vacuum vessel sectors, supported by the overhead in-pit assembly tool, will be aligned and welded together at field joints first as pairs, then as triplets, and finally—in a quasi-simultaneous operation to ensure uniformity—the triplets will be joined to form the completed vessel. Fifty-three port structures, which provide openings to the vacuum chamber for maintenance, heating or diagnostics systems, must also be welded into place during the assembly of the vacuum vessel. If a pencil were to trace over the surface of all the vessel and port structure welds the resulting figure would measure 1.4 km, stretched end to end. But during vacuum vessel assembly the welding tools won't pass just once over each weld ... they'll pass an average of 35 times to build up thickness in 2 mm increments. This brings the total "length" of deposited weld metal to 50 km, requiring at least 25 tonnes of welding wire. The welding tools will have to manoeuvre the complex geometry of the sectors and ports and reach areas that are not directly accessible to operators and where visibility is restricted. 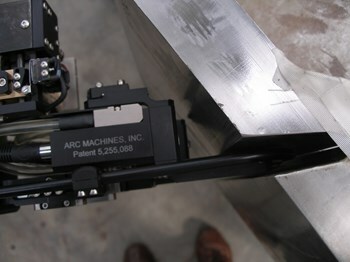 A customized weld head is trialled for splice plate welding. Nine hundred of these ''transition pieces,'' ranging in width from 10 to 16 cm, will be used to assemble the vacuum vessel sectors and port structures. The robots will also be confined to welding from inside the vessel and ports, as the pre-installed vacuum vessel thermal shield makes access to the exterior surfaces impossible. "One-sided welding is unusual and more challenging for welds of this thickness," says Brian Macklin, an engineer in ITER's Tokamak Assembly Section. "Customized equipment and techniques for welding, testing and examination are required. Weld shrinkage—which occurs naturally as weld material cools and solidifies—will have to be quantified and anticipated." In 2012, the ITER Organization awarded the full scope of vacuum vessel welding operations—from the development of tools and qualification of processes and operators, through tool procurement and execution of welding operations at the ITER site—to the Spanish company Equipos Nucleares SA (ENSA). 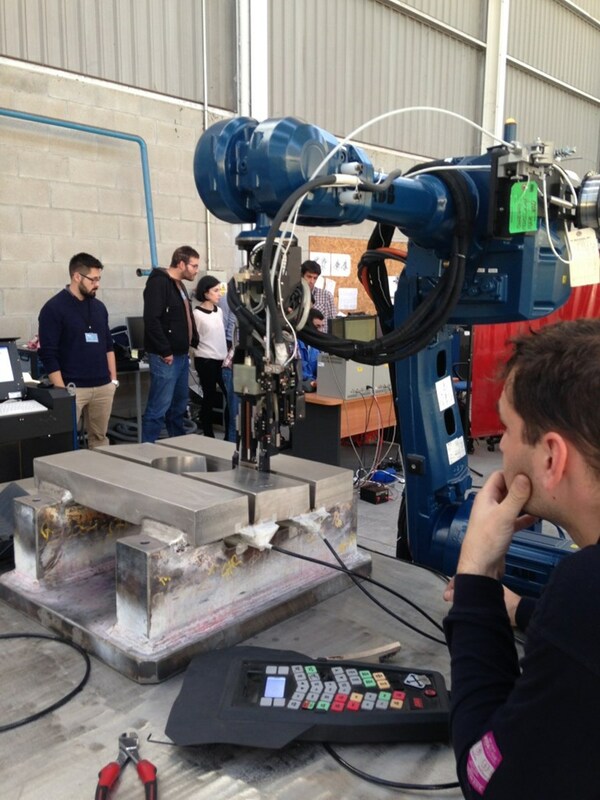 Today, engineering development and trials are underway at ENSA premises in Maliaño and Parbayón, near Santander, Spain, where a 12-person ENSA team is testing prototype welding tools on mockups that reproduce relevant segments of the vacuum vessel or ports. In one area, tests are underway on splice plate welding. The field joints between sectors or between sectors and ports require these transition pieces, which are custom machined to fit precisely. Welding robots will have to manoeuvre through the inner shell of the double-walled vacuum vessel to weld the splice plates of the outer shell, using narrow, custom-designed and custom-built welding torches. The tools are operated remotely, with cameras, screens and parameter monitoring to help the operators guide them through narrow gaps. A biscuit weld head in operation. 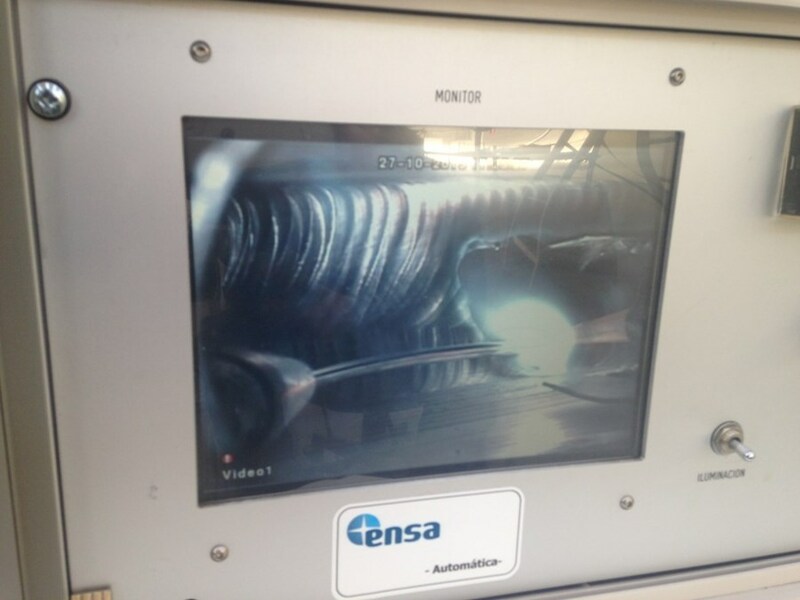 During the development phase of the contract, ENSA must demonstrate all welding and testing operations. 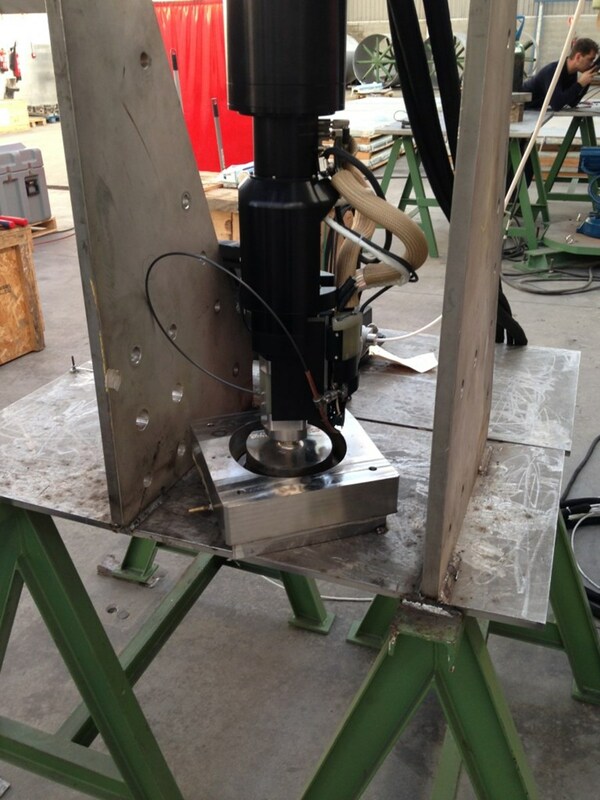 At another station, a weld head is being trialled for the welding of a circular "biscuit," a solution that is being considered to allow the automation of the welding between splice plates. Other tests are underway to select the best filler material, to quantify shrinkage, and to demonstrate the tools on the complex geometries of the port structures, which will represent just over half of all welding work on the vessel. "The vacuum vessel is a Protection Important Component, and it is absolutely critical that we perform high quality welds and that we can demonstrate this quality to the satisfaction of the authorities," emphasizes Macklin. Detailed examination and leak-detection processes are under development to ensure the quality of welds. Visual examinations of the first weld pass (the root pass) by endoscopy is planned as the back side of the weld is not directly visible. The root pass and the final pass over each weld will also be leak-tested, an operation that will be repeated on the completed weld joint when a more precise test is possible. In addition, each weld will be subject to volumetric examination, required by the RCC-MR 2007 code* which applies to the vacuum vessel in order to confirm there are no defects in the weld. Instead of the typical wide-angle V preparation for the weld joint, the joints for the ITER vacuum vessel are "narrow-gap" to limit the weld material and heat input, and thus minimize weld shrinkage distortion. Narrow gap tungsten inert gas (TIG) welding is the technology that will be used during welding operations, with customized weld heads adapted to the complex geometry of the ITER vacuum vessel and ports. This examination is usually performed using radiography, but ultrasonic testing is also being developed for areas where radiography is not possible. The tools for these mandatory inspection tasks will have to work within severe space constraints, for example the clearance between the thermal shielding and the surface of the vacuum vessel which could be as low as 26 mm. At an interim design review, held late October at ENSA, Macklin and two colleagues from the ITER Organization were able to take stock of development work done to date. 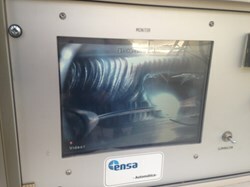 "Before progressing to the pre-production phase of the contract, the ENSA team must demonstrate that they have fine-tuned all the welding parameters, finalized the tools, run the test sequences, and found the best ways of managing the weld shrinkage and distortion and of organizing the work to the required quality." During the automated welding process, operators will use monitors to follow the filler wire (coming from the torch at left) as it deposits filler material over the previous weld passes. The panel was impressed with the work done so far by ENSA and concluded in its report that preparations for the production phase and the welding on-site of the sectors and ports are progressing well. The last step in the development phase of the contract is expected to take place late 2016, when the company plans to demonstrate sector-to-sector welding on full-scale "slices" of the vacuum vessel sectors and full-size mockups of the ports. All of the welding and testing operations will be demonstrated and proven at this stage. "This last step will prove the full set of processes and give us the confidence to proceed with the procurement of the tools for the production work on site."